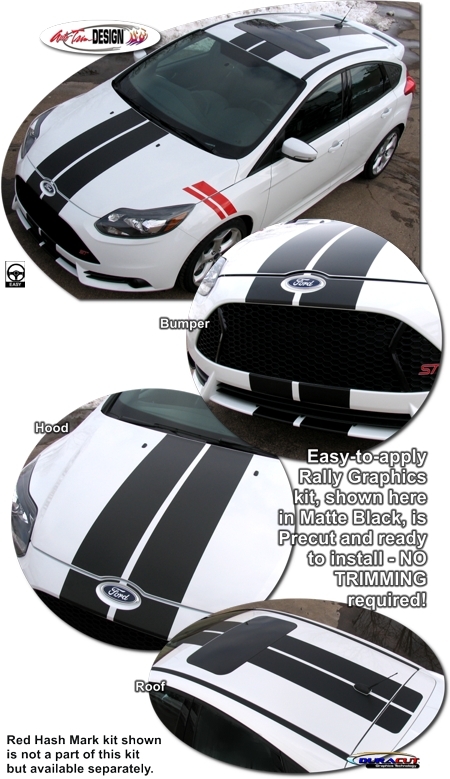 Set your '12-Current Ford Focus apart from the rest with this great-looking Rally Stripe graphic kit. The pieces in this kit are precut and ready to install in a wide variety of colors - NO TRIMMING required (except for Focus models with Sunroof option). Graphics are specifically made for the '12-Current Ford Focus with factory Bumper, Hood and Roof areas as shown and will not fit any other vehicle (please see Graphic Fitment chart below). Stripe package is manufactured for a center spacing of 1" (25.40mm) at time of installation.